Summer fairs may be over, but that doesn’t mean you and your family can’t enjoy a traditional Italian sausage sandwich topped with onions and peppers. Toss in a snow cone or ice cream for dessert, and it’s like an evening at your local fair. Or maybe you’re in the mood for some German-style sausage and sauerkraut or savory sausage casserole to curl up with on a cold night. Whether it’s winter or summer, there’s no match for the fantastic flavor you get from real Italian sausage. Now that you’ve got dreams of sausages dancing in your head, how do you make them come true? 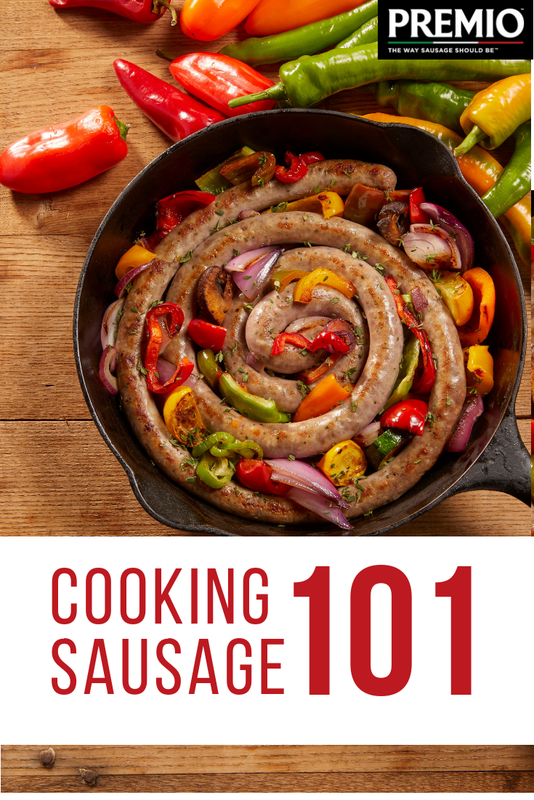 If you’re new to preparing sausage dishes, get started with our four tips for cooking up some real Italian sausage. You know what’s wonderful about sausage? It can meet your cooking mood. Don’t feel like using the stovetop? Not a problem. Can’t grill because of the rain? No worries. Grill: A grilled traditional Italian sausage is something to behold — and taste. If you’ve got an outdoor grill and the weather’s great, take advantage of it! Oven: If you’re a multitasker, broiling your sausage is an excellent option. Pop the sausage in the oven and then go about doing what you need to — from getting the table set to preparing side dishes, like a salad. Stovetop: Adding onions and peppers to your dish? Cooking them with your sausage on the stovetop makes for a delicious combination that’ll leave you and your family wanting seconds — and thirds. If you have a grill and stove, play around with your cooking options to see which one you like best! The golden rule when it comes to traditional Italian sausage is to cook it to a minimum of 160 to 165 degrees Fahrenheit. We recommend a medium temperature, which is around 325 degrees Fahrenheit. Grill: Use a medium flame. Oven: Turn to the “Broil” setting or a temperature of 350 degrees Fahrenheit. Stovetop: Have your dial at the halfway point and add three tablespoons of water to your skillet. Grill: Keep turning your links for 15-20 minutes on the barbie. Oven: Once your broiler is warmed up, let your sausage sizzle for 10-12 minutes in your oven. If you’re not using the broiler, bake for 18-20 minutes at 350 degrees. Stovetop: Cover your pan for 10-12 minutes and then remove the lid to cook for another 5-10 minutes. And remember to make your links dizzy with frequent turning each time. When your sausages are ready, they’ll have a golden-brown appearance. Now, the moment we’ve all been waiting for — drumroll, please! Grab your napkins, plates, drinks and start serving up some traditional Italian sausage. Remember to use oven mitts when swiping them off the grill or out of the skillet or oven. Now that you know how to cook sausage properly, it’s time to put your sausage skills to the test with some simple sausage recipes you can try at home. Made with Premio’s real Italian sausage, these delicious dishes are easy to prepare with your preferred cooking method. Fire up your grill, stove or oven and choose one of these original recipes to start. Don’t forget to save on your sausage with Premio’s sausage coupons online. Keep it simple but delicious with this twist on a handheld favorite, complete with real Italian sausage. Cook your sausage meat and taco seasoning in a pan or your oven until the meat is cooked through and fully browned. When your meat is done, portion it into your soft or hard taco shells and top with cheese, then add your favorite taco toppings! When you’ve got your sausage cooking skills down, this dish is so simple and delicious. In the mood for some comfort food? This creamy mac ‘n cheese is mixed with mouthwatering real Italian sausage for a bowl of homey goodness both kids and adults will be crazy for. Begin by bringing a large pot of water to a boil and adding elbow macaroni, cooking according to package directions. Drain and set pasta aside, then add flour and butter to a saucepan over medium heat and whisk until butter melts. Add chicken broth and half n half slowly, stirring and reducing temperature to low. Continue to cook for about 10 minutes, occasionally stirring until the mixture thickens. Then, add in white and sharp cheddar cheese and keep stirring over low. In a separate skillet, add chopped bacon with butter and saute until browned, then add your sausage rounds. This is where your stovetop sausage skills will shine! Keep turning sausages until they’re browned and firm, then drain your meat with a paper towel and add to your cheese sauce. Stir in your elbow macaroni and dig in. Potato salad is a summer favorite, but who says we can’t enjoy it all year? Try this warm potato salad with sausage — it might just be your new favorite. Wash and cook your potatoes by microwaving, baking or boiling until done, then dice into cubes and combine with baby spinach in a large bowl. Cover to keep warm. Next, cook your sausage according to your preferred method until firm and browned, then slice into coins and add to potato and spinach mixture. Bring a skillet to medium heat, turn off the heat and whisk the Dijon mustard, maple syrup and vinegar, slowly adding in avocado oil and mixing until smooth. Pour over the potato salad mixture and serve. Ready to start cooking up some real Italian sausage? At Premio Foods, we don’t just make mouth-watering sausage. We also make it fun to try them with our downloadable sausage coupons online. Got advice for cooking sausage? Share your suggestions with us below! Is this implying that Premio Italian sausages will be “done” in a 300-350 degree oven after 10-12 minutes? (It says broil OR 300-350 degree oven). It doesn’t even say how to prepare the sausages for the oven, i.e. what kind of pan, do you lightly coate with olive oil and then add a little water to that pan, etc.). Mine are very visibly RAW after 15 minutes in a 375-degree oven, and nowhere near brown, so I don’t know if this instruction is a mistake or what. I have never had plump sausages like these or any other Italian sausage brand be DONE in 10-12 minutes in 3400-350 oven. Great question! We apologize for the confusion, and have updated the blog post with the proper recommended cook times. We recommend broiling the sausage for 10-12 minutes. If you will be cooking the sausage at 350 degrees, we recommend at least 18-20 minutes to reach the internal temperature of 160 degrees. Thank you! I will be cooking about 20 Italian Pork Sausages to put on a bun, for a Halloween get together . I would like to put them all on a large baking sheet and cook them in the oven. You recommend 350 degrees for 18-20 minutes. Will this be enough cooking time for a large quantity of sausages? Also, would you recommend adding a little water to the pan as well? Hi Maureen! We apologize for the delayed response, but hopefully this information will come in handy at your next get together! It’s recommended to place the sausages 1 inch apart on your sheet pan. Cook at 350 degrees for 18 to 20 minutes until the sausages are browned and no longer pink in the middle (the internal temperature of the sausages should be 160 degrees). If you’d like, you can add a little water to the pan to prevent the sausage from sticking to the pan. We hope this helps! Thank you!